England's decision to rest several senior players from the NatWest Series against Australia was not to everyone's tastes. Michael Vaughan, an Ashes-winning captain, who knows what fatigue after the Ashes is all about, suggested half-seriously that spectators should be offered their money back. But when Eoin Morgan, who is deputising for Alastair Cook as captain, spoke of "a great energy" in the squad ahead of the first ODI at Headingley and dismissed suggestions that this series is very much a case of After the Lord Mayor's Show, the case for a freshened-up England squad was hard to resist. Rest those who are weary and open up opportunities to others: it is not a bad philosophy. Those who contended that watching a settled England Test side win the Ashes without much panache at times became a bit of a drag should logically now be beside themselves with joy at the prospect awaiting them. "Young, talented and exciting," is how Morgan described his unproven squad. Morgan did not pull off the conjuring trick of playing in the IPL and still being selected for England's Ashes Test side, that outside prospect coming to grief because of an operation on a broken finger in late June. Before his matchwinning century in Dublin, he managed only one half-century this season. But England's batting order for the Ashes still has one spot still up for debate, the No. 6 slot, and there is the opportunity to attempt the conjuring trick all over again. Captain influentially and score a stackful of runs and England will at least have to throw his name in the mix even if Ravi Bopara's greater commitment to the long-form game makes him a more persuasive candidate. "At this stage of the summer I am taking every innings as an opportunity to score runs and prove what I am capable of doing," he said. "If that opportunity arose at the end of the summer I would be a very happy man." But happiness is drawn at the moment from other places. "The things I've most enjoyed about captaincy has been handing out caps to debutants," Morgan said. "It's fantastic to see guys being rewarded for a lot of hard work over a number of years by pulling the England shirt on and that makes me smile every day." England's greatest risk is in temporarily shelving a successful opening partnership, Cook and Ian Bell, that has been at the heart of their one-day approach in the past couple of years. Michael Carberry looks bound to fill one of those spots, even if there will be some disquiet at his nervous debut against Ireland, leaving the difficult decision about whether Jonathan Trott or Kevin Pietersen - or for that matter Joe Root - partners him at the top of the order. 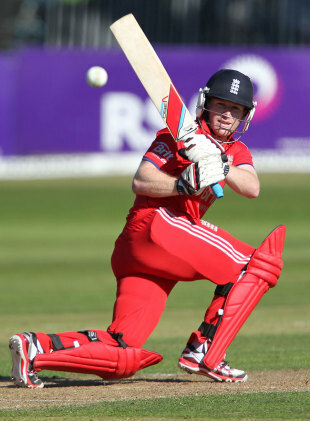 "Kev has opened the batting for England before and done well," Morgan said. "It's certainly an option. He also bats in the middle-order as a very explosive player. He's very versatile in that regard so we'll be looking at both options. The openers are filling big shoes. Cooky and Belly have been a huge part of our success in the past few years. Two new balls makes the role all the more difficult." Whichever route England take will be disruptive to some degree. Trott has been very settled in the order at No. 3, but perhaps Trott, too, would be more adept at facing the new ball. It is a tough decision. There are other issues, too. With Morgan and Bopara both making hundreds in Ireland, and Jos Buttler fulfilling keeping duties at No. 7, the easiest way of including Ben Stokes is as a bowling allrounder at No. 8, as happened in Ireland, a role he must contest for at Headingley with Sussex's uncapped Chris Jordan. The use of Stokes as a third seamer might suit England - even though they looked a bowler light at times in Ireland - but it does not necessarily suit Stokes, whose batting and bowling for Durham carries equal potential even if the bowler-friendly Chester-le-Street pitches do not always encourage such a notion. His Championship hundred in Durham's toppling of the erstwhile leaders, Yorkshire, at Scarborough last week was his first of the season and he made a mature contribution. It is to be hoped that Stokes gets a run one way or another. He is a much-improved cricketer, a sleeker figure than the player who was sent home in disgrace, along with Kent's Matt Coles, for one too many late-night drinking sessions on a Lions tour of Australia last winter. Stokes says he now feels entirely "forgiven" by the England management for his England escapades. He promised Durham's director of cricket, Geoff Cook, that he would mend his ways after his Australian excesses and so he has. He is in the England squad while Coles has been loaned to Hampshire for the rest of the season after declining a new contract at Kent. He remains a straightforward lad, yet to adopt too many trappings of an England player, and took a simple pleasure in tweeting a picture of himself and some of his Durham team-mates tucking into a celebratory Chinese takeaway after their Scarborough victory. Such is the efficiency of England's backroom staff that he will probably have received an analysis of the meal since then, complete with a printout of its calorific content, energy quotient and restful sleep maximisation percentage.